This second page of Continental accessories is a bit of a mixed bag. There are short-lived items such as the Subbuteo tie, and club flag, but it finishes with the first two cups, the European Competitions Cup, and the lovely Jules Rimet. Another accessory to add realism to your stadium layout... contains "score cards". This was a rather strange item. Half-time scoreboards were once common at football grounds, but I must admit they was a bit of a mystery to me when I started playing Subbuteo in 1979, aged ten. This item didn't perplex me for long however because its final catalogue appearance was 1980. The set was available in three versions. The first version was introduced in 1965-66 at a cost of 2/11d. It was made from black plastic, and was shown in the 1960s brochures standing behind the fence surround. The scores on this version were fixed (it is just one long sticker), so it was only for show. At some point in the late 1960s the scoreboard was changed to a version that clipped into the red fence surround. This version reduced the number of scores displayed (from 18 to 7), but supplied scorecards that could be cut out and slid into the board making it useable. The catalogues did not make it clear when the changeover occurred, but the best bet is 1969-70, when the price increased to 3/6d. However, scorecards were not mentioned until the following year (the 1970-71 catalogue rewrote a lot of item descriptions). Of course, 1970-71 was also the year that the green fence debuted, so it is possible that the red half-time scoreboard had a very short life. With the arrival of the green fence came the final version of this board. This worked in exactly the same way as the red board by slotting into the fence and by having scorecards. The brown posts from the fence surround were often glued onto the ends of this item (but not always). Box types:- The original black scoreboard came in a lovely long thin 1960s box with white sides and stapled ends. Later on though, it was reissued in a bag. The red scoreboard received an illustrated box matched to the other early 1970s accessories, such as the flags and the training packs. The green scoreboard was sold in the same box as the red version for most of its life, but it did get a box with a more accurate illustration in the hobby-crest re-box. The final 1980 date means that any later boxes are unlikely. Mounted on pole and stand, the flag is available in red, white, blue, maroon, and old gold. Cut out adhesive sheets supplied showing individual teams of the English and Scottish leagues and a wide range of international teams. Although the flag left the accessory range in 1972, it continued to feature in the big boxed editions of the mid 1970s, such as the Munich World Series and International Editions. Mounted on pole and stand, the flag is available in red, white, blue, maroon, and old gold. This set only appeared in the 1965-66 catalogue. It was just set C112 without the cut-out adhesive sheets, and cost 2s 4d, as opposed to 3s 11d for the full package. The stickers were also available separately as C114 in that catalogue. I guess if you wanted to buy several flags, you would only need one set of stickers to decorate them, so this set was logical. I have illustrated this item with the picture I previously used for C112, as this does not have the sticker sheets shown. However, the box clearly stated "with names of famous clubs", so there should be a C113 box without this line. This all seems a bit excessive, and SSG clearly had a change of heart. On the next year's price list (1966-67) the range dropped back to C112, and a new C113 was produced the following year (see below). 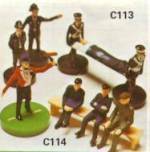 C113: Ambulance and Policeman Set. Comprising 2 stretcher bearers, stretcher patient, and two policemen. This set first appeared in 1967-68, and lasted until the1980 catalogue after which it was replaced by the police squad (C159), and the first aid set (C184). There were two versions of the set produced, and the illustration above shows the difference between them. On the left of the stretcher is the 1960s set, which included two tall policemen on big green bases, and two small ambulance men on fixed square bases. This version was still illustrated in the 1972-73 catalogue. The new redesigned set (shown right) was first illustrated in the 1975-76 catalogue and continued until 1980. The detail here is much better, and the figures all look like they come from the same set. Pack types: Both sets would have been sold in bags, with a standard Subbuteo stapled header card (mid-1970s version shown). The later set appeared on the first (hobby-crest) bubble card. Many thanks to Eddie Lang who provided the early version of this set for the above scan. For use with the Football Club Flag. As mentioned above, this original use of C114 appears in the 1965-66 catalogue. The adhesive sheets cost 1s 9d. 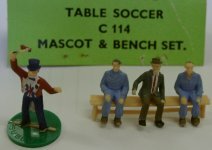 C114: Mascot and bench set. Comprising mascot painted in England's colours, manager with two reserve players sitting on touchline bench. The mascot in the top hat is Ken Baily, who also appeared on the Football Express box. Somewhat unsurprisingly, there are variations to this set as well. The original set (shown left) was introduced in 1967-68, had a manager in a tie, and reserves in old style tracksuits. Ken Baily has his rattle in his right hand. The set was illustrated in 1972-73. The newer set was illustrated with the new C113 in 1975-76. Here, there is one substitute with his arms crossed, and one with his legs crossed. The manager has a cloth cap, and somehow reminds me of Bill Shankly. Here Mr Baily is waving his rattle in his left hand. I expect both versions of Ken are available in the two base variations - thin and named, or thick and plain. The bench set was replaced in 1976/77 by C139 which was the first outing for the more familiar clear plastic bench. That set originally featured the same bench occupants as the final C114 (sadly minus Ken). With single spot motif of footballer in red, silver white, with the word Subbuteo underneath in silver-white with red and yellow stripes on an attractive green background. Length 49in. with pointed end. Isn't that just the greatest description? Introduced in 1967-68, this was a very short-lived item, with 1969-70 its final appearance. It is one of the few numbers to get reused. A few ugly Subbuteo ties have surfaced in Italy, but none match this description. 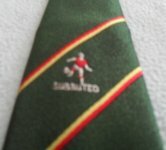 July 2013:- At last, the official Subbuteo tie is illustrated in all its glory. Note the lovely old kicking footballer logo (my favourite among them), and the moss green colour. This is just the best tie ever. Well done to Ashley Hemmings, who sent this one in. It only took 14 years to get this illustration!! This was a sensible re-number of the lovely brown match scoreboard that had been introduced as a replacement Set Z in 1969. As the replacement flags of this vintage came straight into the Continental range, it does seem odd that this set did not get a new number on arrival. It became C115 in 1973, and continued on that number until 1978. The catalogues used the "Z" suffix until 1977, probably because the set was still being sold in the original box. The old number was finally dropped with the "hobby crest" box produced in the late 1970s. The scoresheets supplied just covered the English and Scottish leagues, and the home nations, although World Cup team names were also issued and foreign boards included their own sheets. The British team names were updated when necessary with Hereford replacing Barrow, and Wimbledon appearing in the final sets. The last issue of the board was a World Cup 1978 version with World Cup name cards printed in red. It was replaced in 1979 by the black stadium scoreboard (C158), which had large legs designed to display the board over the new terracing. The football version was still being advertised in Dutch catalogues of the early 1980s. Box types:- Just the two boxes. The early 1970s "waving boy", shown under Set Z, and the "hobby crest" version shown here. 3in. diameter... in red, green and black on white vinyl, depicting a Subbuteo footballer motif. Suitable for sticking on cars, and bicycle saddlebags. Figuring most Subbuteo players weren't old enough to drive... Thanks to Paul Eyes, this item is now illustrated. Note that the football figure is the correct one for the era. Like C115, this was introduced in 1967-68, and 1969-70 was its final appearance. The number was reused in 1973. A fully illustrated booklet of elementary and advanced rules for the experienced player, explaining the best methods of beating your opponent. This item first appeared in the 1973-74 catalogue as C116C. The second "C" referred to item "C" in the old A-Z range, which switched across to this range in that year to fill in one of the unused numbers (along with C109M, and C115Z). However, there was a difference between the two items. Although the price lists still called C116C the "Advanced Table Soccer booklet" until 1976, the catalogues were more accurate, as the description at the top of this section from 1973-74 shows. Under this reference, the basic rules, advanced rules, and the "spin!" booklet were all combined into one handbook. Of course, this was also the rule book in the boxed sets, so you only needed to buy C116 if your dog (or gerbil) ate the original. This combined handbook had different rules in the basic and advanced sections, and this was pretty confusing to new starters (I should know, as I was one). So eventually the basic rules were split out again. The full handbook survived until 1981-82. Its replacement in 1983 was a "revised" handbook on ref C193. Like the original C116, this only had the more advanced tournament rules within it. I have now illustrated three versions of the booklet. The first two (dated 1972 and 1973) are pretty similar, but you might see that the logo is slightly different. The early version still had the "Super Set" in the advert for boxed sets inside the front cover. The second version lost this, but gained the Munich Edition description. Both advertised Football Express on the back cover. The final version is the one I had as a kid. It had the Chiddingstone Causeway address, and the newer range of box sets (i.e. Stadium Edition). The basics were the same, but the advanced rules have been updated and lengthened. For example, the offside rule (rule 4) now had eleven points, instead of five. No wonder I was confused. Four corner flags on bases with built-in ball raising recesses for improved corner kicks, and two halfway line flags. These were the big orange flags that also appeared in the box sets from the early 1970s, and of which there can't be many left that haven't been sat on and glued back together repeatedly. Oh joy. They made their debut in the big late 1960s catalogue, and on the 1969-70 price list. They were part of the first big expansion of the "C" range, where numbers C117-C126 all arrived at once. They replaced the flag set in the old range (Set T, with its metal posts), which was immediately dropped. There were two versions. The original set (shown left) had a triangular orange flag on a white stick. A drawing of these appeared as "new" in the late 1960s catalogue. These had quite a short period of production, as by the time of the first illustrated price list (1972-73) they had been replaced by the much more common big square flags (shown right). The square flags were closer in look to the old Set T.
Both types of flag came on the same green bases. Whilst Set T was designed to push through the cloth (and therefore hide the bases), the plastic base sat on top of the pitch. Subbuteo's designers made this into a positive change by providing a ball-raising recess on the corner flags, to make lofted corners much easier. The flag itself was then on a thin bar, so as not to interfere with the player taking the corner. I have been advised that this worked really well, as long as you were willing to stick the base down (blu-tac would do). When not taking corners, the flag could be turned around, so that the base did not encroach onto the field. As I've already mentioned, the flags soon found their way into the boxed editions of Subbuteo from the Club Edition upwards. Room was made for them below the pitch in the early 1970s sets. 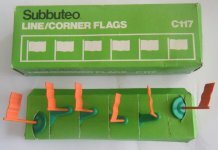 As most kids had to play Subbuteo on the floor, and as the flags were near the edges of the pitch, most quickly broke, and it is hard to find sets with the full compliment of flags. The big flags reign came to an end when a set of smaller flags (that were even more prone to being sat on) was introduced in 1981 as C188. The old faithful C117 kept going in tandem with the new for a couple of years, but 1983 saw them dropped to the "order only" accessory list, and that was the last we saw of them (and they left the box sets at the same time). Box Types:- The flags were originally sold in a long thin box, complete with card insert to keep them safe. This was an illustrated early 1970s box with kicking logo, and a nice demonstration of how they worked. This was the only box the triangular flags were sold in, although the square flags also used it. This shape of box was updated to the "hobby crest" range, before being replaced by a smaller square box, where the flags were jumbled in loose (the rugby flags received a similar box at the same time). It is unusual for any accessory to have two boxes within the same range, but this one does seem to. C119: Jules Rimet World Cup. These two cups arrived in 1969, and were the first in an intermittent series of replica trophies. Obviously not in any Subbuteo scale, these sets are basically designed to look nice on a shelf in your games room (you don't have a games room?) The original boxes folded so you could display the cups within them, and had nice coloured inserts to make the cups stand out. The Subbuteo book Flick to Kick mentions a full size World Cup sculpted for Subbuteo by Dave Pomeroy, which was to be scaled by their head draughtsman, Keith Buckwell. The tale goes that when the World Cup was stolen, Mr Buckwell put their full sized copy in the window of the Subbuteo offices with a "for sale" sign, which resulted in a police raid. The real cup was stolen in March 1966, so this story suggests that Subbuteo were aiming to release their version for the 1966 campaign. However, it was actually released later than that. We turn once again to Charles Stadden's invoices for further insight into the design process. The European Cup (C120) is another item that needs a little explanation. The one produced by Subbuteo was the smaller version held aloft by Real Madrid countless times in the late 1950s. However, by 1967 (and Celtic's win) the cup had already changed to the design still handed out today to the Champions League winner. Mind you, even the Observer's Book of Football of the 1970s still showed this old trophy, so perhaps we can forgive the error. I wonder how many of us bought it in the 1970s/1980s thinking it was the European Championship trophy. The later style of European Cup finally arrived as C204 in 1983. Both these cups survived right through the "Continental" number era, with the European Competitions Cup bowing out in 1983, just missing a 61xxx number. However the Jules Rimet did hang on until 1984 to briefly become 61119. This may seem surprising as the Jules Rimet was, of course, won outright by Brazil in 1970 and all subsequent World Cups have used a different trophy. I guess the Jules Rimet's survival was down to its attractiveness, plus the fact that England won it in 1966, That match must've been replayed in miniature ever afterwards. Either that, or the stock sold very slowly.... Interestingly, the new style World Cup only turned up in time for the 1982 championships (C182) - and even then it didn't succeed in out lasting the Jules Rimet - both were removed in 1984. Actually, Subbuteo have a run of bad luck on their cups. This started with the original European Cup not being the version won by Celtic or Manchester United. Then the Jules Rimet was won outright one year after Subbuteo produced it. Then the League Cup was produced just before the Milk Cup replaced it, and the corrected European Cup was produced just as English sides were being chucked out of Europe. Sad, but true. Box types: The original "diving goalkeeper" box used for these cups, and the statuette (C120), are the most common version. The cups were both transferred to the late 1970s illustrated box (hobby crest era). On a plinth in all club colours. This set was introduced alongside the two cups in the 1969 catalogue. Charles Stadden invoiced for a 3" statuette of footballer about to kick the ball. Carved and engraved in whitemetal (tin alloy)" two weeks before his invoice for the World Cup shown above, so this lovely figure must be his work. The statuette came in the same design of box as the cups, with a similar insert. The nice original catalogue illustration (shown middle, above), suggested that the Cup plinth would be used, but in fact the player received a short round plinth instead (as shown in the photo). This obviously helped with stability. The statue could be hand-painted in any of the club colours on the team lists. As it survived in the catalogues until 1975-76, (being removed in the 1977 purge), this suggests that it could be painted in any team colours up to reference 190. However, the unsold stock of this item floating around the Subbuteo collecting community suggests that the more common range would be that of 1971-72, which was 1-81 plus the 1970 World Cup sides (later added to the team range between 150 and 166). 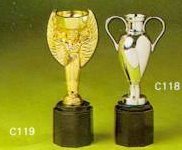 The 1971-72 catalogue does stress that new teams 76-81 are available under C120, and a separate 1970 World Cup flyer advised that "teams and statues" were available in the named box range. However, a few later reference numbers have been sighted, the most common being ref 93 Roma. I have also seen the "named box" Derby County in statue form (shown on the Team odds and ends page). I would suggest that if the early numbers were only selling slowly, the later ones would have been painted by request only. I could be wrong though. I originally suspected that shops would only keep a few popular teams in this format, but Chris McKay remembers his local stockist in Edinburgh having all the major Scottish teams in 1971. So anything is possible. Box types:- Just the one box for this accessory - as illustrated. Never mind, as there are lots of statues to collect instead.